Oak Marr is a 50-meter pool with 21 lanes of short course pool. We will be running two (2) courses for the meet, one 8-lane course and one 7-lane course. 11 and over preliminaries sessions and the 10 and under sessions will be swum in two courses, finals sessions will be swum in one course. Lanes will be available for continuous warm-up and warm down throughout the meet for the 11 and over swimmers. · Fairfax County Park Authority limits the number of swimmers and overall number of persons in their aquatic facilities for safety reasons. EACH SESSION WILL BE LIMITED TO 600 SWIMMERS. ENTRIES WILL BE ACCEPTED ON A FIRST COME FIRST SERVE BASIS. The Meet Manager will endeavor to inform invited teams promptly when the meet has been fully subscribed. · NO DECK ENTRIES WILL BE ALLOWED. NO EXCEPTIONS. · Spectators are not allowed on the pool deck and seating is limited. · NO FOOD or concessions available at meet. · Swim & Rock T-Shirts will be sold at the meet. · FREE PROGRAMS: Meet programs will be available to down load @ www.seadevils.org November 14, 2007. · PROGRAMS: A limited number meet programs will be sold during the meet. Meet Programs available will include every event and session and will be sold for $15.00. · FINALS PROGRAMS: Will be available at the meet at no cost. All certified officials wishing to volunteer to work this meet please contact John McKenzie at JandDmck@aol.com by Sunday November 4, 2007. Please include your club affiliation, certifications held, and sessions you wish to work. Officials assigned to this meet should sign in at the Admin table at the start of the Warm-up. Certified officials, who have not been contacted, should volunteer their services to the Referee. Participating clubs are required to provide timers in proportion to their entries. The meet manager will determine the number of timers per club and any lane assignments. The prescribed Potomac Valley Swimming warm-up procedures and safety policies will be followed. For 11 & Older Prelims and 9-10 Sessions, teams will be assigned lanes for warm-ups. Coaches are responsible for monitoring their swimmers during warm-ups and the meet. For 11 & Older Finals, there will be open warm-ups with assigned sprint and pace lanes. Note: The Meet Manager reserves the right to modify the warm-ups based on the number of entries. Coaches will be notified by email in such an occurrence. Open to all USA Swimming registered swimmers from the invited teams listed below. Athletes shall compete at the age attained on the first day of the meet. Invitations will be sent via email by the Meet Manager. Contestants may enter a maximum of seven (7) individual events and may not participate in more than three (3) individual events per day. For the 11 & Over Sessions contestants may not swim in more than 2 events on Saturday. Teams may enter two (2) relays per event. Due to the limited space, relays are only swum in the 9-10 sessions. Email entries are preferred. See email address below. Include the entry file from Team Manager, as well as a report by Swimmer and a report by Event. Teams entering by mail, please send two computer disks (Hy-Tek). Include one meet entry report by swimmer and one report by event. Fees for individual events are $6.00; relay events are $10.00. Each club is requested to remit one check to cover the entry fees for the entire team. Team Manager (download zipfile - now posted), unzip it and then go to team manager/file/import/meet events). Link As” and with Microsoft Explorer right click on the mouse and select “Save Target As”. · All entries must be received no later than 5:00 PM, Tuesday, October 30th. Each session will be limited to 600 swimmers. Entries will be accepted on a first come first serve basis. The Meet Manager will endeavor to inform invited teams promptly when the meet has been fully subscribed. The above date is the deadline for clubs to submit their entries to the Meet Director. Therefore, clubs usually set an earlier deadline to receive entries from their swimmers. Check with your club for this information. Meet Directors are requested to acknowledge receipt by return email within 24 hours. Clubs submitting entries that do NOT receive an acknowledgement should contact the Meet Director by calling: 703-331-2170. A Final - Top eight (8) qualifiers from prelims swim in finals. · A & B Finals - Top sixteen (16) qualifiers from prelims swim in finals session. Order of Finals is B, A. All entrants in the 500 Free and the 400 IM will swim in Prelims in the appropriate session. Top eight (8) qualifiers in each age group will advance to the A Finals. · The 11-12 500 Free will swim as Timed Finals in the Friday Prelims Session. Scoring will be through Top 16 for the 500 Free and the 400 IM. The Meet Manager has determined that Dive-Over Starts will be used at all morning preliminary and afternoon timed final sessions. Coaches are requested to review Guidance for Dive-Over Starts for Coaches. Officials are requested to review Protocol for Dive-Over Starts. 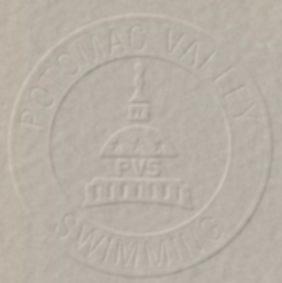 PVS scratch rules apply for swimmers scratching finals. If a swimmer fails to properly scratch from a final event and does not appear for the final, he/she will be barred from further competition for the remainder of the meet, unless excused by the Referee. All events 200 and up will be positive check-in. Positive check-in times may be adjusted. Events # 19, 20, 21, 22, 23, 24, 27, 28, 29, 30 – 8:30AM – Events: 27, 28, 29, 30 will swim fastest to slowest in Prelims session. Events # 75, 76, 77, 78 – 8:15AM - Events: 77 and 78 will swim fastest to slowest in Prelims session. All swimmers entered in an individual event will receive a swim cap. Medals 1st through 8th place and ribbons 9th through 16th place. Ribbons 1st through 8th place for relays. * - Positive Check-In event, see Meet Announcement for closing time. @ - Timed Finals swum fastest to slowest in prelims session. % - Top 8 finishers in Prelims will swim in the finals session. Swum fastest to slowest in prelims session. % - Top 8 finishers from Prelims will swim in the finals session. % - Top 8 finishers from Prelims will swim in the finals session. Swum fastest to slowest in prelims session.